Adullam Grove Nature Reserve (Hebrew: שמורת טבע חורש עדולם‎) is a nature reserve in central Israel, south of Beit Shemesh, managed by the Israel Nature and National Parks Protection Authority. The reserve was established in 1994, covering 5,380 dunams (5.38 km2; 2.08 sq mi) and was extended to include another 1,152 dunams (1.152 km2; 0.445 sq mi) in 2004. The reserve was declared in order to protect Mediterranean forests, woodlands, and scrub that grow naturally in the area. Flora include Buckthorn trees (Rhamnus palaestinus), Oak trees, Greek Strawberry trees, Pistacia lentiscus trees, and various types of Cistus and Hyssop. ^ שמורת טבע חורש עדולם - חורבת מדרס [Adullam Woods nature reserve - Hurvat Midras] (in Hebrew). Archived from the original on 19 July 2011. Retrieved 1 December 2010. 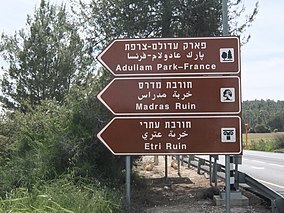 ^ "Adullam Nature Reserve" (in Hebrew). iNature.info. Retrieved 2010-12-01.